Lake Inari is beautiful and wild - over 3300km of shoreline and a labyrinth of more than 3300 islands. 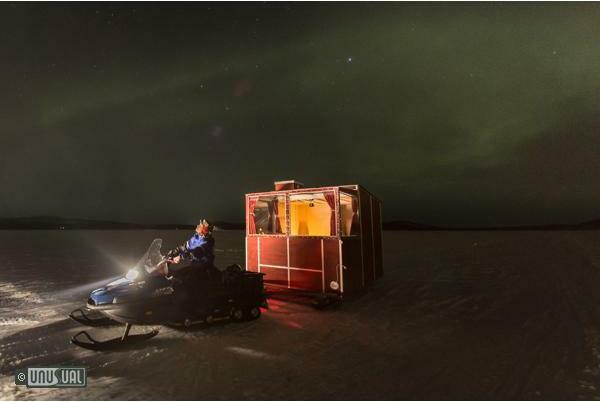 The frozen lake surface is barren and offers a safe and unique overnight to experience the Northern lights, especially from the comfort of your cabin or hot tub. The cabin has everything you need to experience the Northern Lights in comfort - including a double bed, safe heating, lights and of course a loo... You can also book a sauna and hot tub. 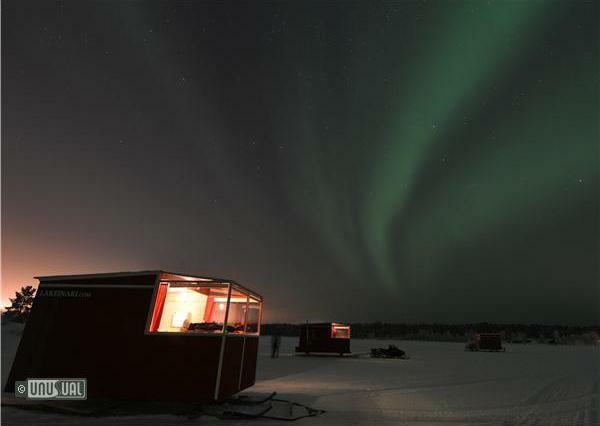 Enjoy the Northern Lights from these innovative cabins! 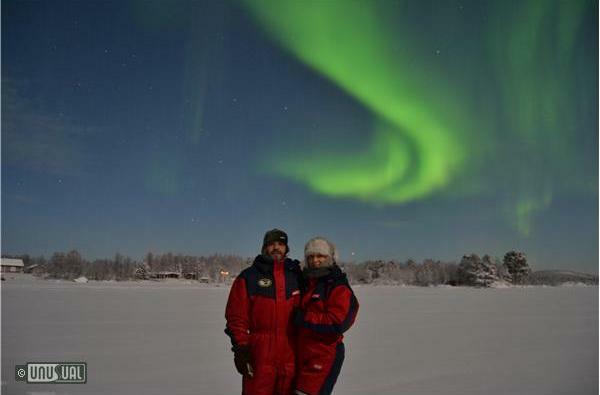 In September-November the cabins stay in Aurora Base Camp 2km from the village in a great aurora watching place. 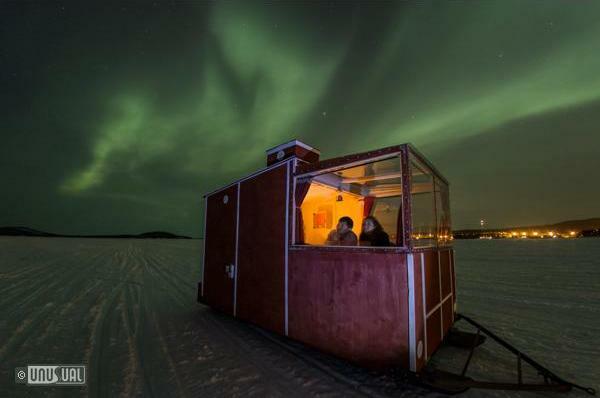 In December-April day time the cabins stay close to Inari village facilities with restaurants, public transport, sights and activities. 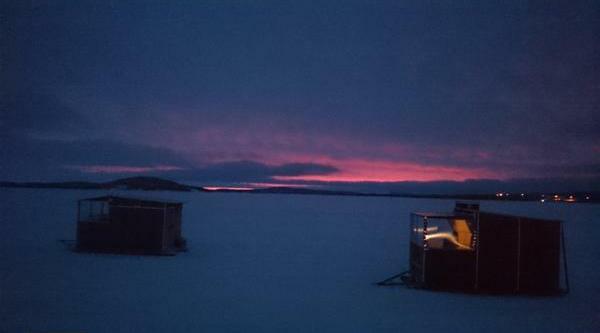 In the evening owner Esko moves your cabin by snowmobile further to a private place on the frozen lake for overnight. Every room has a safe heater, double bed, table with chairs and a toilet. Cabins do not have electricity or running water but tons of unique atmosphere! 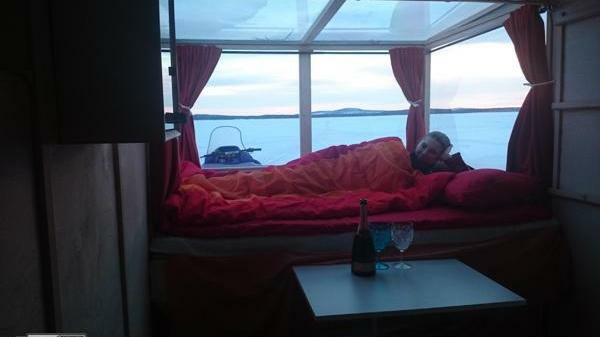 Washing up is possible in the mobile sauna & hot tub or in Hotel Inari on shore. 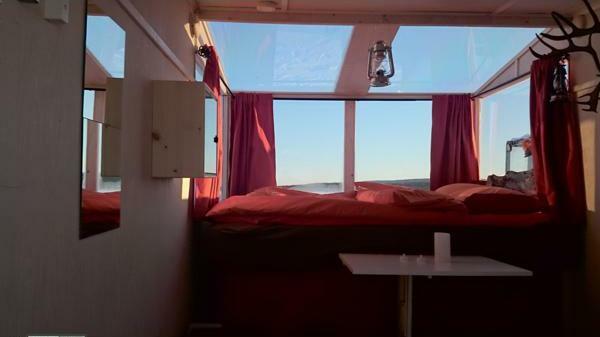 and no running water nor electricity. When you arrive, Esko will accompany you to your cabin on the lake shore. 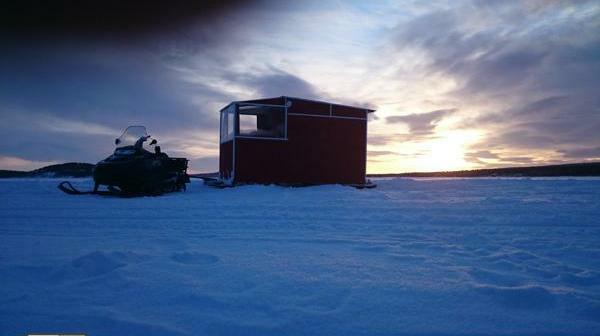 In the evening he moves you and the cabin by snowmobile out to a nice private place on the lake ice for overnighting. You can book sauna & hot tube there too! In the morning Esko will come back and move you and the cabin back to the lake shore of the village. So during daytime you are near the village facilities. 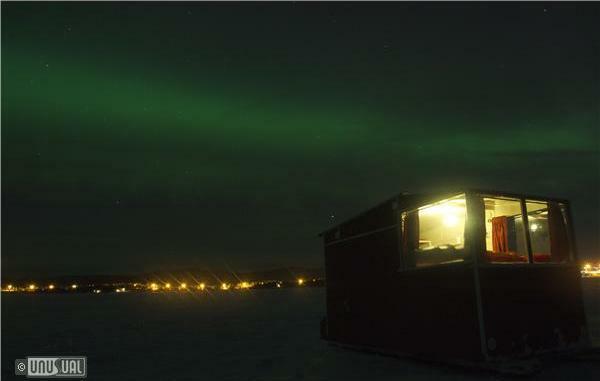 With extreme cold weather and in September-November the cabins stay in the Aurora base camp 1km from the village centre. 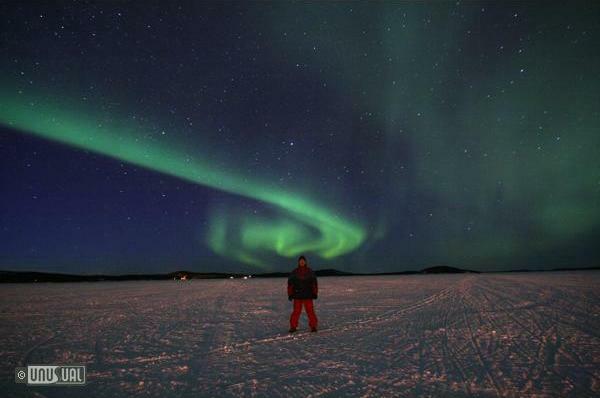 It is great aurora watching place too. minus €60Eur for a single. Meals and shower can be bought from Hotel Inari in the centre. For example a rich breakfast buffet in Hotel Inari costs €12Eur/person and shower €3Eur/person. 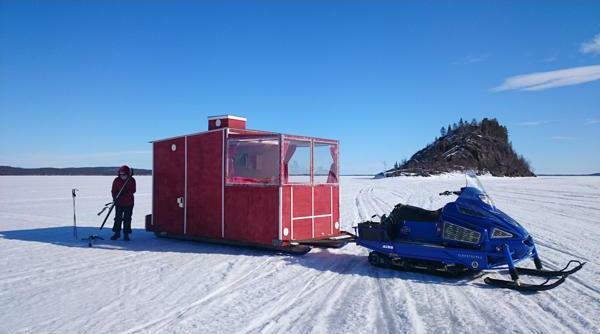 For winter 2015-16 Esko will offer also a mobile sauna & hot tube!! Nearest airport is Ivalo (Finnair, Norwegian). Airport transfer booking from this link to the Hotel Inari bus stop there you can meet your host Esko. Please let him know when you'll arrive. Great museum Siida and culture house Sajos. Nature trails near the village & info of the area. Easily reached from the low-cost airport gateway of Luleå in Northern Sweden, Vuollerim, on the edge of the Arctic circle, celebrates the traditional 21st June Midsummer with a village-wide party at the community homestead, on the nearest Friday.